Abstract. To study the influence of regional biomass burning emissions and secondary processes, ambient samples of fog and aerosol were collected in the Po Valley (Italy) during the 2013 Supersito field campaign. After the extent of fresh vs. aged biomass burning influence was estimated from proton nuclear magnetic resonance (1H NMR) and high-resolution time-of-flight aerosol mass spectrometry (HR-ToF-AMS), two samples of fog water and two samples of PM1 aerosol were selected for ultrahigh-resolution Fourier transform ion cyclotron resonance mass spectrometry (FT-ICR MS) analysis. Molecular compositions indicated that the water-soluble organic matter was largely non-polymeric without clearly repeating units. The selected samples had an atypically large frequency of molecular formulas containing nitrogen and sulfur (not evident in the NMR composition) attributed to multifunctional organonitrates and organosulfates. Higher numbers of organonitrates were observed in aerosol, and higher numbers of organosulfates were observed in fog water. Consistent with the observation of an enhanced aromatic proton signature in the 1H-NMR analysis, the average molecular formula double-bond equivalents and carbon numbers were higher in the fresh biomass-burning-influenced samples. The average O:C and H:C values from FT-ICR MS were higher in the samples with an aged influence (O:C = 0.50–0.58, and H:C = 1.31–1.37) compared to those with fresh influence (O:C = 0.43–0.48, and H:C = 1.13–1.30). The aged fog had a large set of unique highly oxygenated CHO fragments in the HR-ToF-AMS, which reflects an enrichment of carboxylic acids and other compounds carrying acyl groups, highlighted by the NMR analysis. 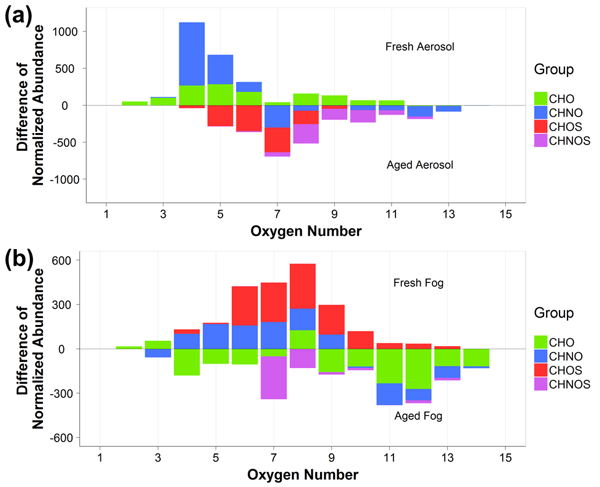 Fog compositions were more oxidized and SOA (secondary organic aerosol)-like than aerosols as indicated by their NMR measured acyl-to-alkoxyl ratios and the observed molecular formula similarity between the aged aerosol and fresh fog, implying that fog nuclei must be somewhat aged. Overall, functionalization with nitrate and sulfate moieties, in addition to aqueous oxidation, triggers an increase in the molecular complexity in this environment, which is apparent in the FT-ICR MS results. This study demonstrates the significance of the aqueous phase in transforming the molecular chemistry of atmospheric organic matter and contributing to secondary organic aerosol. 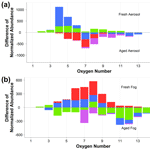 How to cite: Brege, M., Paglione, M., Gilardoni, S., Decesari, S., Facchini, M. C., and Mazzoleni, L. R.: Molecular insights on aging and aqueous-phase processing from ambient biomass burning emissions-influenced Po Valley fog and aerosol, Atmos. Chem. Phys., 18, 13197-13214, https://doi.org/10.5194/acp-18-13197-2018, 2018. The detailed molecular composition of ambient fog and aerosol influenced by regional biomass burning and secondary processes was studied. Aerosol and aqueous-phase functionalization and oxidation were observed, leading to fog compositions that are more "SOA-like" than aerosols. The significance of the aqueous phase in transforming the molecular chemistry and contributing to secondary organic aerosol is demonstrated here.